Rates are in US dollar for up to 8 adults. 1-2 children may be accommodated; ask for details. Sat. to Sat. 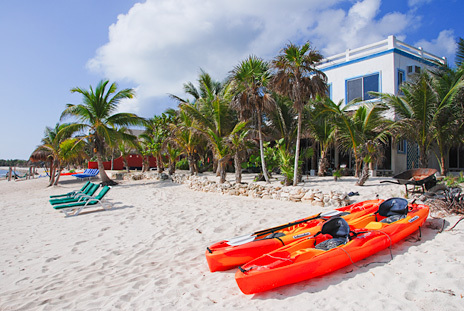 (7 nights) reservations only Dec. 20 to April 25. Minimum of 4 nights and flexible dates remainder of the year. 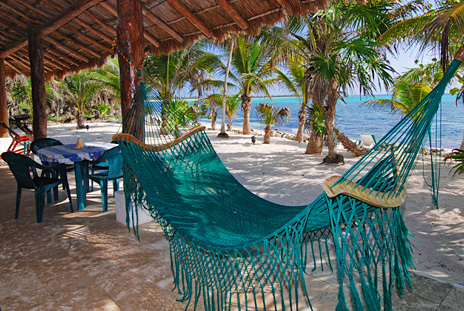 This tropical Soliman Bay vacation rental hideaway is nestled in a lush garden setting along Soliman Bay on the Riviera Maya. 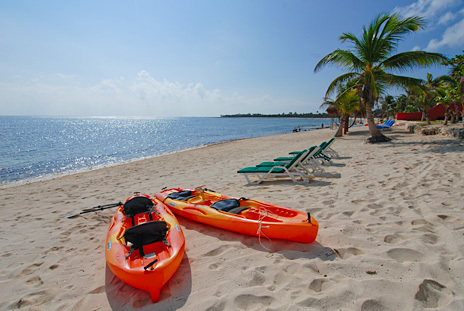 Soliman Bay is perfect for those who are seeking a getaway far from the hustle, bustle and glitz of Cancun. This bay is a tropical paradise with no hotels, condos or resorts; only private villas and beach bungalows dot the sandy, palm fringed beach. You'll be in vacation paradise if you appreciate peace and quiet, sun and sand, bright stars, glorious sunrises and sunsets, and the gentle sound of waves lapping the powdery shore. 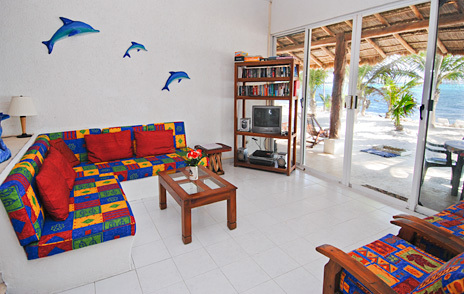 Tres Delfines (3 dolphins) vacation rental villa offers a large sandy beach with much privacy, many outdoor living areas, including swimming pool/patio/garden area, palapa covered patio off the living room/dining room area, a large second floor outdoor patio area and a third level rooftop observation area as well. Inside are all the comforts of home with 4 bedrooms (all with ocean views), 3 baths, fully equipped kitchen, living room and dining room. 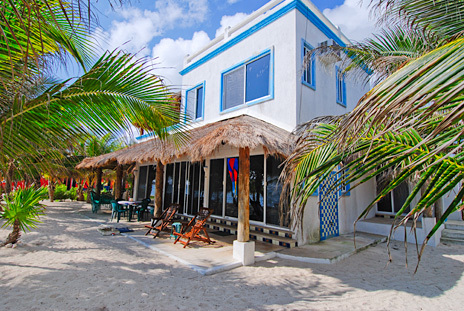 As you approach Tres Delfines beach vacation rental villa from the road, you'll notice a white privacy wall with the name of the property. Enter the gates along a stone path to the lush garden area brimming with green tropical plants and flowers. Focal point here is the 10-ft. high stone wall waterfall with water gently streaming down the rocks to the pool below. The pool is multilevel; shallow end is perfect for children; older children and adults will appreciate the deeper waters in this natural, freeform style pool. 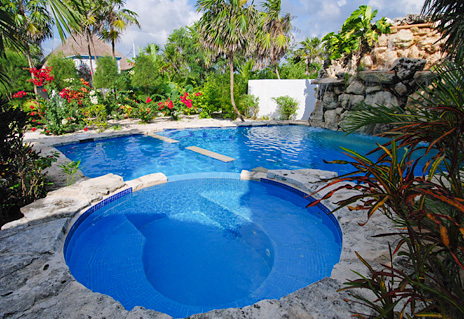 You can spend a lot of time in this garden setting; lounge in the sun, take a dip in the pool, enjoy an icy cold cerveza. or toss a few shrimp on the BBQ. Other outside fun spots include the large second level patio and the third level rooftop observation area. 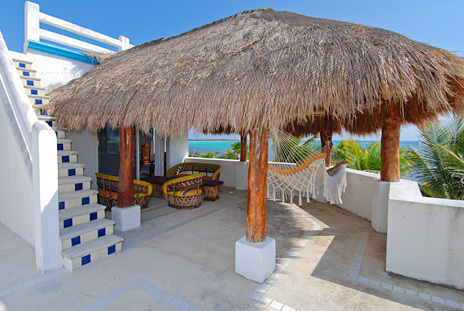 If you've had too much sun, duck under the palapa cover on the second story patio. Choose either area to work on your all-over-suntan. Grab your morning coffee and enjoy the spectacular views as you have your first cup of java. Both of these high altitude patios serve as an ideal spot for star gazing as you sip a rosty margarita. 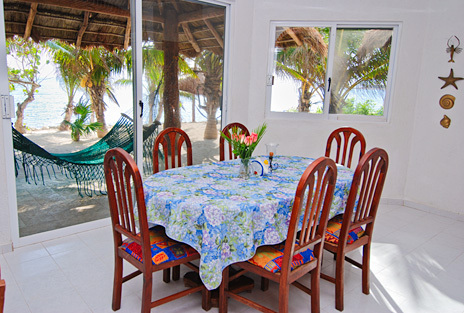 Don't forget the oceanfront patio right out the sliding glass doors from the living room/dining area, or stroll to the private palapa on the beach and relax as you think about the plans for the day. 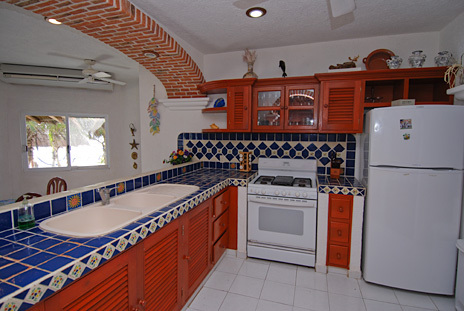 Inside the property are all the comforts of home, including a fully equipped kitchen with 4-burner gas stove, oven, microwave, double sink, frig, pots, pans and all dishes. Washer and dryer is not for guest use but the maid may be willing to do some of your laundry. Living room has sofa and two chairs, entertainment center with direct TV (including HBO, CNN English channels), VCR and CD stereo. Dining room has seating for 6 plus 4 bar stools at the dropped lunch counter. Adobe brick arches create a look of distinction. 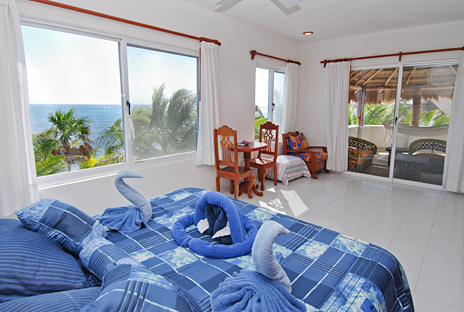 Tres Delfines vacation villa has 4 bedrooms, all with air conditioning and ocean views. Three bedrooms are located on the first level. First bedroom has 2 twin beds which can be made up as king. This room has pool views and sliding glass doors to the beach/ocean. 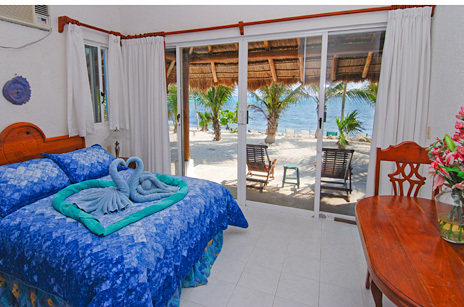 Second bedroom has queen bed and ocean views with sliding glass doors to beach/ocean. These two bedrooms share the bath located off the hall. 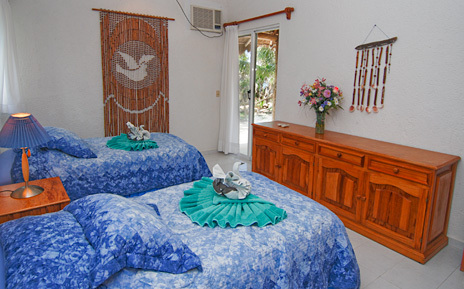 Third bedroom has queen bed, private bath and sliding glass doors to a private patio along the beach area; this room also has a separate entry to the pool/garden area. Fourth bedroom is on the second level and has windows on three sides with sliding glass doors to second level patio; private bath has double sink. 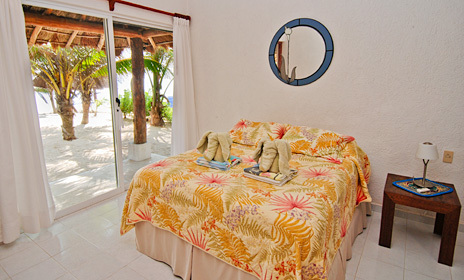 Tres Delfines is a delightful beachfront vacation rental villa, offering plenty of space both inside and out. 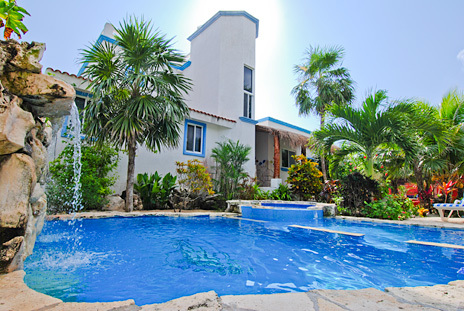 You'll love this vacation villa on Soliman Bay.